I believe that art is loving the task. When you are doing something you truly enjoy and you continue to do it, you become an artist. The more you do it the more you want to do it. When we relax and enjoy ourselves, we become creative and our capacity to problem solve grows big and strong. Practicing what we love fosters confidence because when we are able to submerge ourselves in a practice, process or activity that is wholly satisfying, we become like children at play. We forget to worry about what others think of us. Our bodies and minds connect to what we seek to achieve, and we find purpose. To find purpose elevates our existence. I believe mathematicians who love math are artists. The biologist that loves the study of biology is an artist. I believe a bicycle repair person who loves repairing bicycles is an artist. A teacher who loves to teach is an artist. When you love what you do, you find new and different ways of getting it done. You learn to trust your instincts and test the faith you have in yourself. If you are drawn to your work and delight in overcoming its obstacles, you may even become an innovator. This may sound radical because many of us do what we do out of a sense of responsibility. We do what is expected of us. We work out of necessity, to pay our bills, to provide for our families. We want the best-paying jobs. Most of all we want to be considered successful. However, is that enough if you don't feel like you have connected with your purpose? What if when you attend school, you are actively reminded that it is the place to explore different possibilities; that school is a place to shop for your future; that learning is a treasure hunt and you are encouraged to examine each subject, each experience for possible connections to your bliss? The emphasis isn't judging you as a student. Instead, the school concentrates on offering diverse samplings and building a curriculum that fosters self-discovery. A school should be a place where students are encouraged to approach all areas of study creatively. Where different styles of learning are embraced and celebrated for the diversity they bring to the educational environment. A place where the standards of success are as varied as the individuals seeking successful outcomes. A place where the love of learning is the dominant culture. I admit that the perception that only a few of us are gifted enough to live our lives as "artists", loving our work, feeling connected to our purpose is dangerous to the well-being of the whole community. If art is loving the task, wouldn't it be wonderful if our educational objective was to find the artist in each and every one of us? Want to learn more about arts education, and how Central Indiana is working to ensure arts education for all students? 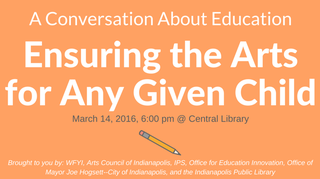 Join WFYI, The Indianapolis Public Library, Indianapolis Public Schools, the Arts Council of Indianapolis, and Any Given Child for "A Conversation About Education: Ensuring the Arts for Any Given Child" at the Central Library on Monday, March 14th at 6:00 pm. More information is available on WFYI's events page. Follow along with this event and other American Graduate conversations on social media, using #AmGradIndy. Deborah Asante, Word Dancer, Truth Enhancer, Book Lover, Joy Discoverer, Blues Chaser, Hope Placer, World Traveler, Jazz Gatherer, Dream Farmer, Child Charmer, Justice Seeker, History Keeper…There are so many ways to say Storyteller. 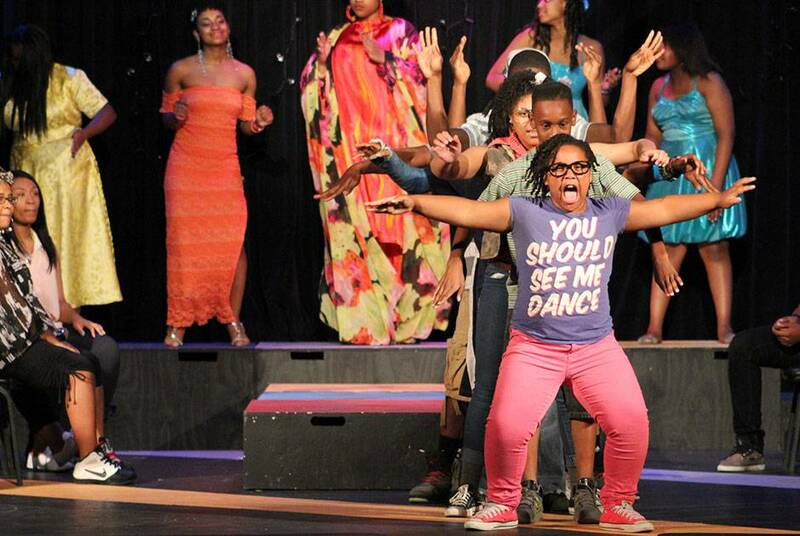 Deborah is also Founding Artistic Director of the Asante Children's Theatre.